When Toxic Water and Oil DO Mix: HYPOXOILAR!! 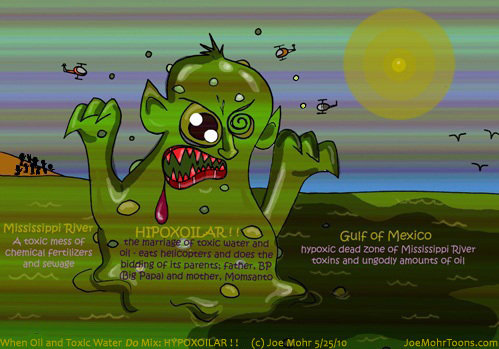 “When Toxic Water and Oil DO Mix: HYPOXOILAR! !” Reposted from Wend’s Greenery page. This is what will soon come to pass as the toxic mess that is the southern Mississippi River continues to mingle and intertwine with both the Gulf of Mexico’s Hypoxic Dead Zone (thanks Monsanto and other companies making chemical fertilizer) and the growing Gulf oil spill (thanks BP and those who refuse to drive less)–HYPOXOILAR! Watch your back! ← Hank D and the Bee: Great Idea!